Brief History The Biblioteca Angelica is named after Angelo Rocca (1546-1620),an Augustinian Bishop, who had responsibility for the Vatican printing house in the time of Pope Sixtus V. Rocca entrusted his collection of 20,000 volumes to the convent of St. Augustine at the end of the 16th century, and provided the convent library with premises and its own funds. His aim was that it should be open to all, and it soon became known to scholars around the World. The library doubled the size of its collection in 1762, with the acquisition of the library of Cardinal Domenico Passionei. The monks commissioned Luigi Vanvitelli to rebuild the convent,which was finished in 1765. The Angelica became a State Library in 1873, so ending the Augustinians' involvement. 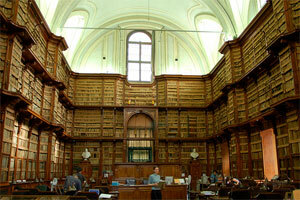 The Biblioteca Angelica is one of the world's great libraries of rare books and manuscripts. The Library's 200,000 volumes include the Antique Book Collection, an outstanding set of works published between the 15th and the 18th centuries. Highlights are rare editions of works by Dante, Petrarch, and Boccaccio. The Manuscript Collection contains nearly 24,000 documents, including 2,700 Latin, Greek, and Oriental volumes. The Angelica houses more than 1,100 incunabula, including an edition of Cicero's De Oratore (1465, the first book printed in Italy) and one of the earliest known copies of Dante's Divine Comedy. The Library of the American Academy in Rome contains over 136,000 volumes in the fields of Classical studies and the history of art and architecture. Especially strong are the collections in ancient Mediterranean archaeology and art, Greek and Latin literature, ancient topography (including the history of the city of Rome), ancient religions, and related fields such as epigraphy, numismatics and papyrology. 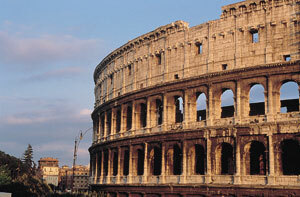 There is a good working collection in the history of art and architecture, especially Italian. The Library also houses small but noteworthy collections in contemporary art and architecture, landscape architecture, Italian history and literature, American literature, historical travel books and music. The Library acquires ca. 2,000 volumes per year and subscribes to approximately 600 current periodicals. The Library is open-stack and contains working space for approximately 80 persons. The Academy is a founding member of URBS, the Unione Romana Biblioteche Scientifiche (Union of Scholarly Libraries in Rome), an association of sixteen libraries with an online union catalogue (www.reteurbs.org/screens/home.html). The Casanatense Library was builted by the Dominicans of the Monastery of Santa Maria sopra Minerva in Rome and opened to the general public, according to the will of Cardinal Girolamo Casanate. Probabilty Carlo Fontana, a well-know Roman Architect designed tha Salone (the hall), but it was finally realised by Antonio Maria Borioni. 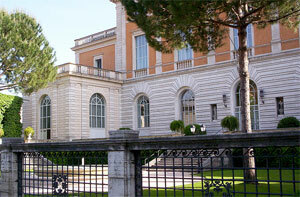 Tje Library was open the 3 of November in 1701, one year after the deathof Cardinal Casanatese. The Library was interested in modern production and antique books, with the aim of being an encyclopaedic library, and for this purpose it was linked to the most important european book commerce centres. Manuscript: about 6.000 volumes of great value such as exultet, liturgical codes, medical-scientific texts, Oriental and Hebraic codes, famous autographs such as that of Niccolò Paganini. Incunabula: about 2.200 volumes among which are unique examples, frist editions, and plaques. Engravings: about 30.000 engravings, increased by Abbot Antonio Ricci's donation and by the endowment of the Chamber of Calligraphy enjoyed by the Casanatense Library until the first half of the 1800s. Subjects: Dramatic theatre, Ballet/dance, Theatre architecture, Music/Music performance.